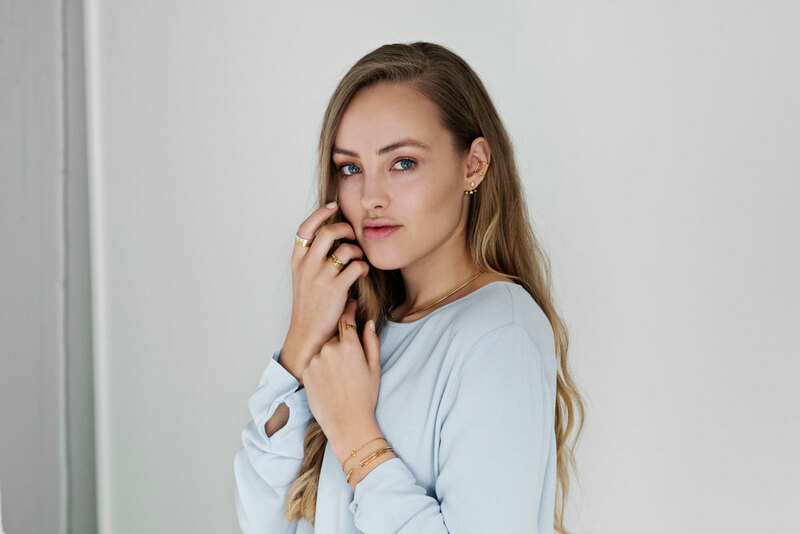 Last month I had the pleasure of doing a photo campaign for the danish jewellery brand Winberg Jewellery and a couple of days ago the pictures finally launched online. Loosing my cool. To seem like a pro, and like i've done it a million times before I should probably stop writing now. But I was once a kid searching for information on how to do this and that, how a photoshoot come together or you name it - so I feel like its my responsibility to share stories. Maybe one need to be reminded that its normal to feel frightened about a task, and that nice things sometimes come together just by making a call or knock on a door. Process. The founder, Lea Winberg, and I had (sometime last year) worked together on defining the visual identity of her brand, and it was a lovely job to do for me personally. Nevertheless I was quite chocked, when Lea all of a sudden called me and said she wanted me to be the face and person of an upcoming shoot she was planning. I freaked out a bit because I still identify myself as a photographer more than a potential motive. So it took some negotiation and pampering before I decided to say yes to the challenge. The thought behind the photos. One of the things that comforted me was the fact that Lea is such a kind person with great aesthetics in her designs, and the fact that she wasn't searching for an experienced model to be a canvas she could showcase her design on. She actually wanted me and the person that I am to shine through in the campaign and it simply made me so happy. What a kickass compliment to get? So with that I thought to myself that it couldn't go all wrong then. Even if the pictures would end up looking like a terrible failure it would still be me... looking terrible, but still me and that would be good enough. So I (wo)manned myself up and had a very teaching, great and fun day together with the team. No doubt that it also made me a better photographer to get in front of the camera and to feel how it is to be guided and instructed to do certain things. MUA. One of my best girls, Mie Frederiksen, took good care of my face and did a beautiful make-up. I ain't the type that knows how to 'contour' (go look it up, I did as well, first I thought it was "kentaur"..) or knows what suits my face in general, so I often just go for simple steps like loads of lotion and a bit of mascara... and after that I don't actually know what the f I'm doing anymore. So I had to trust someone to fresh up my face, and Mie was just perfect and professional. Mad probs to you dear M! So the pictures are finally out, and I'm proud of the process and its result. It's quite challenging to pose naturally with bling in front of your face and in your hair and every way, I must admit. But most importantly its a true honor, that someone wants to trust me their business with my face and personality all over the place. Not sure I believe it yet.